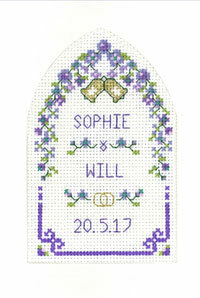 A Purple Arch Wedding card to make a wonderful Wedding Day card. The arched window of the card provides a frame for the detailed purple and mauve floral border. A Purple Passion Arch Wedding card with arched window framing detailed purple and mauve floral border. 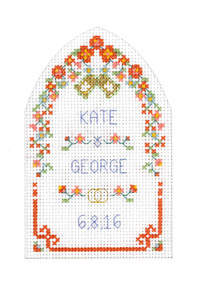 This Purple Passion Arch Wedding card cross stitch kit has only the best quality materials ~ Zweigart fabric, DMC thread, metallic threads, envelope, needle. 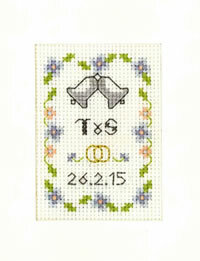 This Purple Arch Wedding card kit is in the Decorative Textiles collection. According to Hindu tradition rain on your wedding day is considered good luck. Peas are thrown instead of rice at Czech newly weds. A Swedish bride puts a silver coin from her father and a gold coin from her mother in each shoe, to ensure that she will never do without.